After conquering the $100 price segment, AMD is introducing a cut down version of their Athlon II X4 processors to fill up the performance and price gap between entry level dual core models and recently introduced Athlon II X4 Quad Core processors. AMD's new Athlon II X3 Series, like its name suggests, is equipped with three logic cores, and is based on AMD's K10.5 architecture, like any other Athlon II or Phenom model. The Athlon II X3 425 model we're reviewing today shares a lot of similarities with Athlon II X4 models, because it is based on a Propus Quad Core with one disabled core. Thus, the Rana core is born, at least on paper and yes, it is possible for the fourth core to be unlocked. Athlon II X3 425 is the cheapest, and slowest version (not including the energy efficient "e" models) working at 2.70 GHz, and with its affordable price tag of just $79, it threatens Intel's new Pentium models. I would like to thank Links for providing the processor sample for this review. 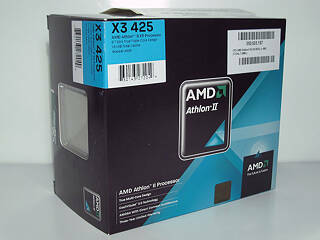 The Athlon II X3 425 comes in a retail package that includes a short installation manual, AMD Athlon II X3 case-badge, AMD-certified aluminum heatsink, and of course the processor itself. 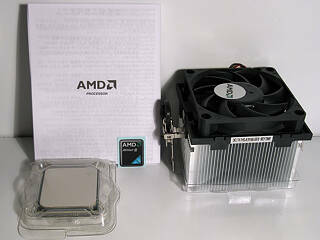 AMD offers a 3-year warranty for all retail processors, including this one.